I remember reading blog posts from international beauty bloggers about this "Birchbox" of some sort and I kind of envy them for having that kind of service available in their country. You see, you just subscribe and they'd send you, monthly, different beauty products, which you could try. It's just so awesome and it will definitely help you decide, which product to buy in the market because you get samples of 'em. Well, you still have to pay for them but you actually get more than your money's worth so for someone who loves trying out new beauty products, it's definitely a great treat. Last night, I received an email, which totally shocked me. Welcome SALAD BOX! Well, it's not something edible; but it's also the same as Birchbox! OMG! I didn't expect that something like this will actually arrive here in the Philippines. For just P500.00 a month you will receive beauty and lifestyle product samples, which will have a value of more than P700.00. But, hey, if you're a fan of international brands, no need to worry. Salad Box has partners with both local and international brands. Pretty awesome, right? They would also have weekly flash sales, getting points for referring friends and many more great deals. Oh, and subscription is a first come, first serve basis. 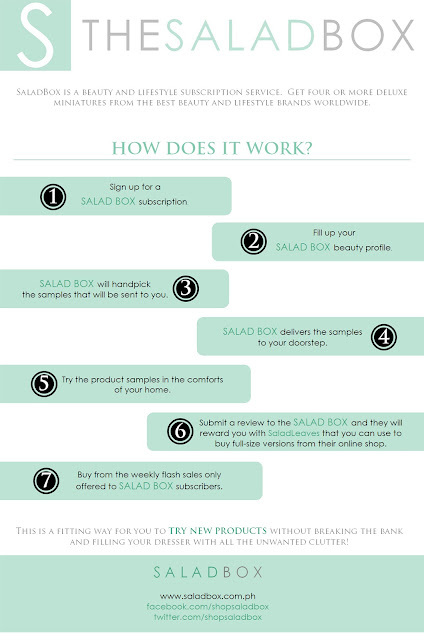 SALAD BOX will be accepting Subscription slots starting September 08, 2012 at 8:00 PM. They will be sending you a link to their subscription application from once it's your turn to subscribe. it's good that we have it here in the phils na.. i've been drooling over glossy box but i think it's available only in the u.s.